Emptying the wine bottle is just the beginning of the fun with this simple hydroponic kit. You know how to empty a wine bottle, don't you? Of course you do. Well, that's just the beginning of the fun with our Bottle Stopper Garden Kit. Once that wine is dispensed with, fill the bottle with water, plug the neck with one of the three hydroponic "smart soil" capsules, drop in some herb seeds (sweet basil, dill, and lemon basil are included), and put it in a sunny spot. Your work is now done. You don't even water this little crop: just watch the everyday magic of germination and growth. In somewhere between three days and two weeks, tiny seedlings will appear. Gradually, their roots will extend down the bottle, absorbing the dissolved nutrients from the capsule. Before you know it, full-sized leaves will appear. Within a few weeks, it's harvest time. Pluck some delectable, aromatic leaves, and add them to dinner—accompanied by wine. Made in New York. 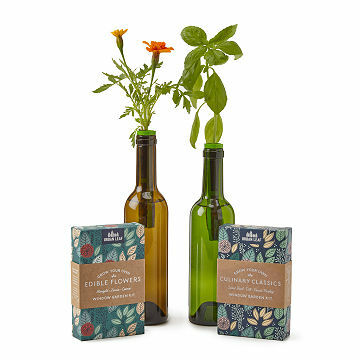 Click here to see what's included in each kit and how the Bottle Stopper Garden Kit works. Nathan Littlewood and Robert Elliott met at Columbia University, and immediately bonded over their shared vision for building a healthier, more sustainable food system. Nate had just left the finance industry, determined to build something that his grandchildren would one day be proud of. He has been obsessed with food since childhood, and has taken cooking classes all over the world, including Toronto, where he received a Certificate of Culinary Arts. Rob was raised on a wood farm in south eastern Massachusetts, and since moving to New York City has made it his mission to make the place a bit greener. His PhD dissertation focused on vegetated infrastructure, and after meeting Nate, he began to use his plant knowledge to design food growing systems. As well as running R&D, manufacturing, and dispatch at Bottle Stopper Garden Kit HQ, he has also become famous for his “Upper Westo Pesto” (fortunately, he has a very good supply of fresh basil). If you're relying on natural light, planting in spring or summer is recommended. For year-round growing a grow light can be used. FOOL PROOF Will buy again and again! We want to be green thumb people, but we kill more plants than we save. This is a fool-proof option and in just 5 days we already are sprouting! After two months sitting in a sunny window in Florida all I have a tiny little 5" stems that look more like a vine. There are few leaves and those that have appeared are about the size of my baby finger nail. My daughter got me this for Christmas and I wish I could get her money back - complete waste! Wonderful for a plant lover in a small space! I love how the herbs provided are usable in your every cocktails and kitchen as well! Great to use if you have left over wine bottles as the seed pods fit very nicely into the necks. Not so good if you aren't a wine drinker and have to purchase other bottles. Make sure the pods fit inside. It is so awesome to find a product that makes growing herbs easily while also upcycling wine bottles. Makes a great gift to give; honestly, I'd love to receive this as a gift as well. Bought this as a Christmas gift for one of my sisters. She liked it so much that I just sent it to my other sister as a birthday gift. They both like gardening and fresh produce, so this gift is very appropriate. Can't wait to hear about their results! A great excuse for my SIL to drink more wine! This was for a Christmas Gift for our son - he is excited to grow the spices. Nice to have fresh herbs on hand in the middle of the winter. Cheerful in the kitchen. A good excuse to go drink 3 bottles of wine! !